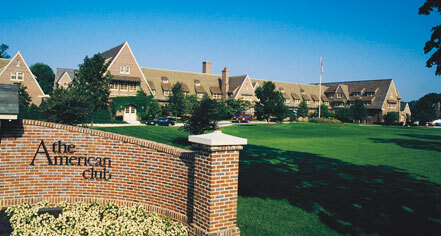 Spread out and stay awhile in the roomy Governor's Suite at the historic American Club in Kohler, WI. The suite includes a dining and generous sitting area along with a mix of classic and contemporary furniture styles in elegant fabrics for an inviting an unforgettable decor. The Governor's Suite includes a television in both the bedroom and the seating area, which includes a full sofa in most rooms, and a chair. This suite offers guests privacy or the space to entertain visitors. Rooms range from 602 - 816 sq ft which includes a King bed, a double shower and a fireplace in select rooms only. 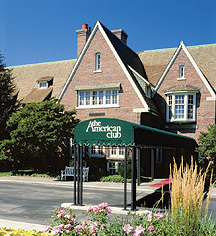 As all the rooms at The American Club, the Presidential Suite is uniquely styled and offers a separate living room and dining area. Genrously sized, the living room and dining room can easily accommodate eight and a gas fireplace completes the coziness of the suite. Similarly generous in size, the bathroom includes a steam shower and a separate powder room. Presidential Suites are 1429 sq ft in size, furnished with a King Baker bed. Suites offer two refreshment centers with wet bars, multiple televisions, and a maximum number of two adults in the King bed accommodations. Indulge in the latest soak technology with the bathroom taking center stage in this luxurious, tranquil suite. Rooms are 787 sq ft with a King bed and include a one-of-a-kind DTV (digital thermostatic valve) custom to this suite. An overflowing sõk® bath with chromotherapy will simply melt the stress away. The room includes two powder rooms and can be reserved in conjunction with the Governor's Suite located downstairs.